Iron Goat Brewing Co.'s new brewery and restaurant on the west side of downtown has been an instant hit since opening in mid April. On a recent Wednesday afternoon, Greg Brandt is brewing in the rear of Iron Goat's spacious new digs on the west side of downtown Spokane in the precious hours before the taproom opens for business. 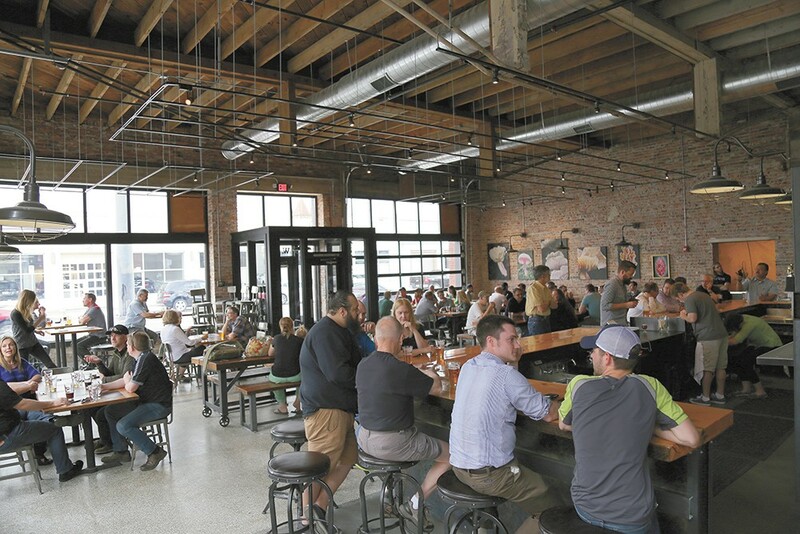 It's been very busy — much more than expected — since the brewery's casual mid-April opening, and while the Iron Goat team is getting used to the space, preparing a restaurant menu and putting the finishing touches on the historic building, they have another worry. They need to make beer. And lots of it. Pubs and restaurants have been waiting on orders slowed by the brewery's move to downtown. They've got bottles to fill. And this weekend, their place will be packed with thirsty fans celebrating Iron Goat's grand opening. "We are positioned with room to grow. We'll be bringing in new fermenters soon, which is a big reason why we moved — to get more fermentation space. It's also nice to not be on top of each other," says Brandt, walking through the spacious brewing area located through a mostly glass wall behind the taproom. It's only been four years since Greg and Heather Brandt teamed up with another couple, Paul Edminster and Sheila Evans, to found Iron Goat Brewing Co. The company's growth, however, often sees it mistaken for a much older piece of the region's beer landscape. Between 2014 and 2015, Iron Goat just about doubled its production, helped in part by the release of 22-ounce bottles, as well as a loyal following who would pack the original brewery in a downtrodden (to put it nicely) residential and industrial area in east Spokane. The just-opened space on Second Avenue is new to the company, but very old to the city. The 1921 structure was built as an automotive school, before becoming a trucking company, a Chrysler dealership, a car wash, a brake shop and then home to Jones Automotive. Iron Goat placed the building on national and local historical registries and worked to restore the heritage of the location. "We wanted to maintain the historical presence of the building. And it's always been industrial to a certain degree, and we've tried to maintain that," says Brandt. 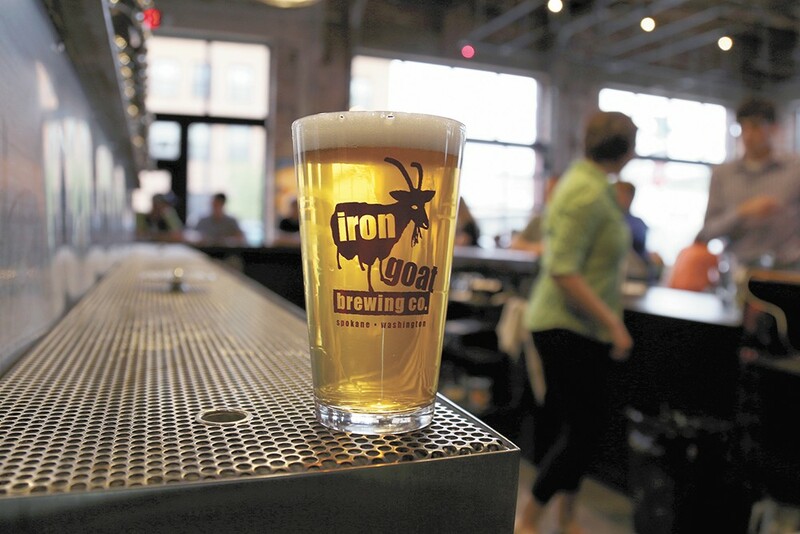 Iron Goat plans to expand its beer list at its new spot. This meant leaving a lot of exposed brick, ceiling boards and trusses, and rehabilitating the original floor on the taproom side. A lot of the work was done by the four partners and their staff. Heather and Sheila made many of the pub's tables, including two massive common tables, and Paul and Greg helped gut the building in the early days. The team also moved the brewery equipment — towering steel fermenters parading through downtown on trailers like some sort of brewing arms race. The result of the pub side of the brewery is an open and spacious spot that kept a lot of the charm of their much cozier original location. "A big part of having the common tables and no TVs is that we want people to meet and talk and make friends. It's meant to be a social place and not so much just, 'I want to watch a game and be on my own.'" Perhaps the most noticeable change is the addition of a full food menu. Chef Thomas Johnson says that the menu will feature a number of Neapolitan-style pizzas, meats and cheese plates, a beer cheese soup and other pub fare. All of it will go well with beer, he assures. "If you come up to [the staff] and want to know what to drink with something, they can help you find a good pairing," says Johnson. Iron Goat is happy with the neighborhood, too, says Brandt. The auto district borders them to the east and south, and the Kolva-Sullivan Gallery is just across the street. And in the nearby blocks, there are more stops for beer tourists. "One thing about plopping down here is that River City is down the street, Orlison is around the corner and the incubator project guys [Steel Barrel Tap Room] are right down the street. Then you've got Barrister [Winery] down the alley. It's like a little fermentation area," says Brandt. As they settle into the new spot — which also allows for increased storage, office space and a lab — there are more things to come. They own a sizable alley on the west side of the building which is set to become a patio. Also, a few seasonable and barrel-aged beers are in the works, some of which will arrive in stores in 750 ml (wine-size) bottles. There's a lot on the horizon, but Brandt is quick to say they're not rushing to grow any faster than beer drinkers want them to. Speaking of Iron Goat Brewing Co. Sat., April 27, 12-6 p.m.